As the internet evolves, so do the challenges encountered in the marketing field. Looking back, Web 1.0 was a place where people read HTML, but Web 2.0 has evolved into a place for writing and sharing content. It is a place of converging ideas, thoughts, cultures, languages and ultimately, information. With the rise of user generated content being shared, there is a direct correlation to news topics and stories regarding its regulation in the cyber world. The “legal implications of the Internet’s rapid development are rendered even more complex by the specific features of its relationship to existing laws, regulatory frameworks, and the ideas that underpin them,” (Flew, 2008). Issues that have been brought into mainstream conversation lately regard legalities and legal ramifications of the cyber world. Marketers must be aware of cyberspace laws as they are becoming issued, especially laws regarding their extent to free speech and their use of intellectual property. Increasing knowledge and content from citizen marketers has recently brought about the topic of free speech online. As citizen marketers criticize companies and generate and publish their content for the world to access, they are facing issues regarding the extent their information is deemed okay under free speech laws, and where it isn’t. 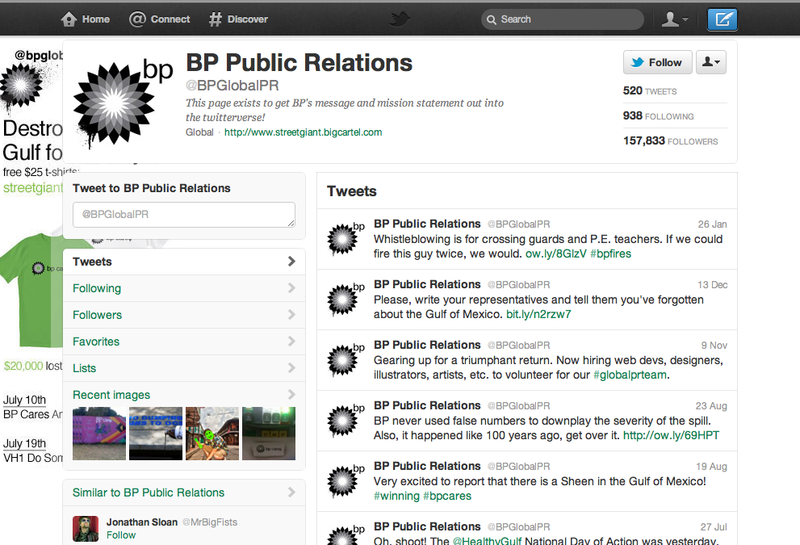 For example, in response to BP’s oil spill in the Golf of Mexico in 2010, citizen marketers created an account on Twitter called #BP Public Relations, (“Twitter,” 2012). The cite has numerous contributors, and over 157,000 followers who continue to add content and remark about BP’s oil spill and the after effects and response, as seen in the screenshot below, (“Twitter,” 2012). Unfortunately, the invisible lines that currently run the cyber world explaining what the extremes of free speech are not completely defined the same across platforms, thus there the confusion of where the lines are and where lines should be drawn. The question I pose is, if no one is in control or regulating content, will there soon be laws dictating the extent of a person’s free speech online that must be adhered to? Similar to the confusion of one’s free speech online, citizen marketers and journalists are also facing copyright issues pertaining to the use of intellectual property. In many popular websites and social media sites under their privacy and conditions section, there is information about how the content published on the site can be used. Since many people do not bother to read through this information, they do not realize what they are signing away by agreeing to the terms and conditions. Wait… I am agreeing to what? This case study that has recently been in the news is the new internet phenomenon, Pinterest. An article was released explaining that a lawyer interested in photography looked into the Pinterest’s copyright laws and found that under their terms and conditions that,“YOU ACKNOWLEDGE AND AGREE THAT, TO THE MAXIMUM EXTENT PERMITTED BY LAW, THE ENTIRE RISK ARISING OUT OF YOUR ACCESS TO AND USE OF THE SITE, APPLICATION, SERVICES AND SITE CONTENT REMAINS WITH YOU,” (Shontell, 2012). Thus meaning that each pin that is uploaded must be original or give credit to whom it originated from. The story goes on to say that she closed her Pinterest account in fear. After the article was released, Pinterest co-founder, Ben Silbermann admitted that “there are issues with Pinterest and the fear of claims of copyright infringement,”(Shontell, 2012). On Youtube’s video, Pinterest and your rights- Tech Tonic, they bring up the idea that the “traditional copyright model is dead,” (ReutersTV , 2012). If traditional copyright is dead, what will be the newly adapted copyright laws? With the evolving use and dependency on the internet for information, the problems marketers face are legal. What was once known as free speech is slowly becoming limited speech. Those among the marketing industry have to be careful of what they say and how they communicate online. Unfortunately, since the internet is a public domain there are little laws and enforcements as of today being done regarding these issues.As they say, there is no such thing as a free lunch, and as we can see now, this is being applied to the cyber world; there is no such thing as free speech or free content. This entry was posted in Marketing and tagged Business, Carolyn Spencer, CarolynNSpencer, copyright, law, marketing, online, pinterest, social media, technology. Bookmark the permalink.